When you’re born with a name like James Kirk, and rise to the rank of Captain in an advanced, powerful military force, you have a fair amount of responsibility. Odds are that the most familiar Captain Kirk to many of you out there is William Shatner’s iconic starship commander from Gene Roddenberry’s beloved sci-fi series Star Trek. But he’s not the only one. The United States Navy has their very own Captain James Kirk (it’s James A. not James T.), who is about to take over command of the USS Zumwalt, the most advanced destroyer in the fleet. On the eve of his new assignment, he, and his crew, received a congratulatory letter from the man who brought his fictional predecessor to life. 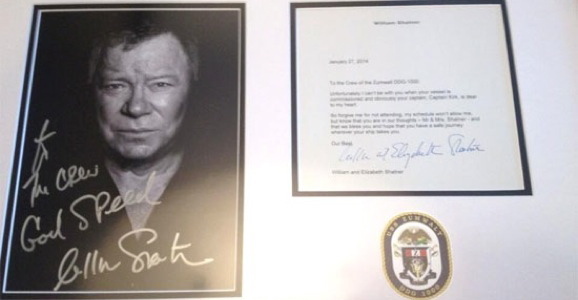 Shatner’s letter is brief, but to the point, and hell, when your middle name is Tiberius, you don’t have time to waste on words. Kirk is a man of action, after all, not a diplomat. The note, which is signed and framed, now hangs at the Bath Iron Works in Bath, Maine, where the ship is being built, though it is expected to find a permanent home on board the Zumwalt. Unfortunately I can’t be with you when your vessel is commissioned and obviously your captain, Captain Kirk, is dear to my heart…So forgive me for not attending, my schedule won’t allow me, but know that you are in our thoughts — Mr. & Mrs. Shatner — and that we bless you and hope that you have a safe journey wherever your ship takes you. Our best, William and Elizabeth Shatner. The Captains Kirk share more than just a name and rank. Both men were also named as the commanding officers of the most advanced pieces of hardware their respective fleets had to offer. 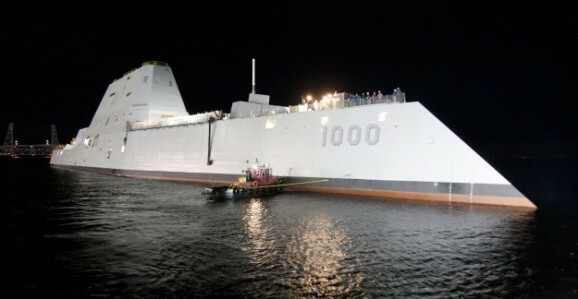 While not nearly as high-tech as the Enterprise—it can’t fly, and probably wouldn’t do well beyond Earth’s atmosphere—the Zumwalt is still the fanciest boat the Navy is currently floating, and pretty damn impressive. The 610-foot (186-meter) vessel cost a cool $3 billion, and tips the scales at 15,000 tons. When the craft becomes operational in 2016, it will become the first American ship to employ an election mode of propulsion. It will also be a sneaky little guy, with a deckhouse made of a cutting-edge composite and an angular shape that should make it appear no bigger than a small fishing boat on radar. The strange-looking design is intended to allow the Zumwalt to pierce waves and decrease the wake it produces, hiding it even further. The weapons systems on board will also be futuristic. It produces enough power that it could one day carry an electromagnetic rail gun capable of firing a projectile at six to seven times the speed of sound, which the Navy thinks could ultimately replace old-school guns. In the near future, the Navy also intends to test the viability of a low-cost laser weapon to shoot down drones. This is like something out of a 1980s TV show like Airwolf or Knight Rider. He may be fictional, but he’s not a predecessor. 1. They need to rename the ship, 2. my world is in harmony because of this.